I just got back from a trip to Boston. The trip was pleasant enough but I’ve gathered enough empirical evidence on unpleasant aspects of travel to present some solid conclusions. 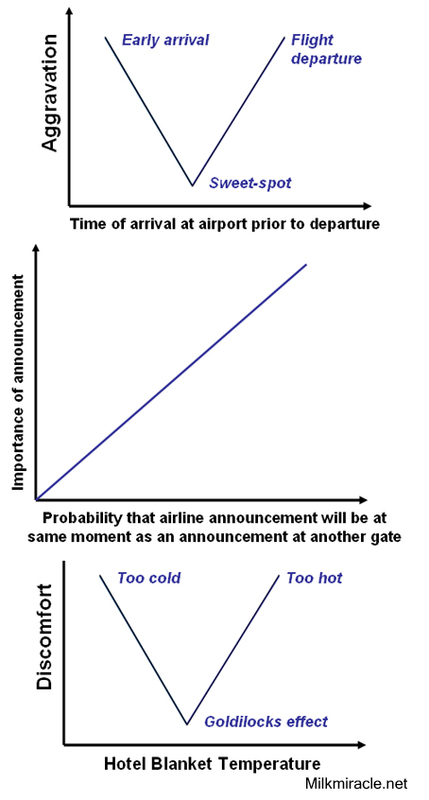 And because I have graphs you know they have to be correct. Every Bengali is familiar with Sukumar Ray’s inimitable book of verse Abol Tabol (আবোল তাবোল) which was published in 1923 a few days before he died. One of my favorite verses in Abol Tabol is Khuror Kol (খুড়োর কল) which has been translated as Uncle’s Invention by Sukumar Ray’s son, noted filmmaker Satyajit Ray. Chandidas’ uncle has created a machine which will revolutionize science. Even though these verses are exceptionally difficult to translate, in Satyajit’s version the machine is described as akin to a perpetual motion machine. Sukumar Ray also provided ample cartoons and illustrations throughout his book. Chandias’ uncles machine was fastened to the shoulder and had food dangling in front. As someone would get hungry he or she would try to rush toward the food, but of course that would not be possible. As this person would get hungrier, more energy would be burned but it would keep going defying the laws of thermodynamics. (Those of us who have studied thermodynamics at some point in life love to stick it to Sadi Carnot). Sukumar Ray was probably familiar with the American cartoonist Rube Goldberg and the British cartoonist W. Heath Robinson who were popular around the same time. Both are still well-known in their native countries for the illustrations of exceptionally complicated devices used to perform simple everyday tasks. Rube Goldberg’s legacy is lasting in The United States and every year a competition is held in his honor. Teams try to devise the most complicated working devices that perform simple tasks. 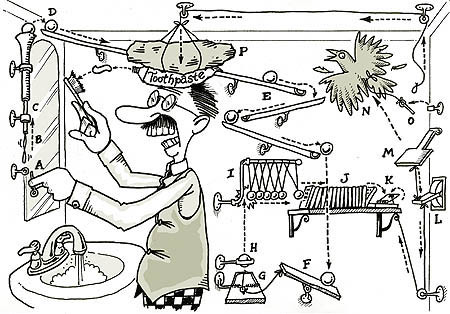 In addition, in American English a “Rube Goldberg Machine” is a very complicated device with a very remote chance of succeeding in the purpose it was created for. Chandidas’ uncle’s machine is not as complicated as most of Rube Goldberg’s contraptions. 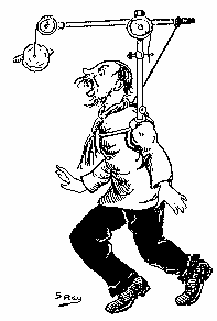 In fact, it bears a more striking resemblance to W. Heath Robinson’s device in “First Lessons in Walking”. Notice the common shoulder-strap and the dangling present in front. In any case, what I think we need to foster innovation is an annual Chandidas’ Uncle Machine Contest! Disclaimer: Low-resolution images are used. I believe these images are now in the public domain per U.S copyright laws.